With eight distinctive villages, Falmouth MA is a Cape Cod vacation town that's sure to suit any visitor's desires. If you're looking for a Cape Cod town with a "walkable" main street, Falmouth has it. For those visiting in the off-season, a good variety of shops, restaurants and lodgings stay open year round. Best of all, there's always something to do around town, whatever time of year you're here. Where is Falmouth on the Cape Cod Map? One of the many draws to Falmouth as a vacation destination is its location in the southwestern corner of Cape Cod - bordered to the west by the warm, placid waters of Buzzards Bay, and to the south by the open seascape of Vineyard Sound. Do you prefer not to have too far to drive once you've crossed the bridge onto Cape Cod? 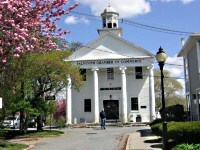 Falmouth is only about a 15-20 minute drive from the Bourne Bridge. I do have to caution you, however, that Falmouth is a little bit out of the way if you're planning on taking excursions to the more distant parts of Cape Cod. In the off-season with no traffic to contend with, it takes about an hour to drive from Falmouth to the National Seashore, and about 90 minutes to Provincetown. During the summer months (especially on the weekends), figure on 2 hours at least. Historic Falmouth Village is a fantastic place for shopping, museum hopping, and relaxing over lunch, dinner, or a evening cocktail at a trendy bistro or pub. 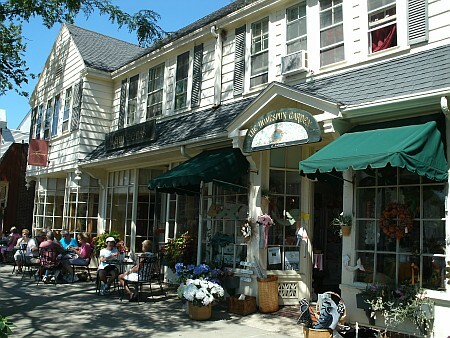 During the summer months, the village is the scene for arts and crafts fairs, a weekly farmers market, and the ever-popular outdoor "Movies Under the Stars". The Shining Sea Bikeway is a great way to explore the town, by bike or on foot, any time of year. The 10.7 mile, paved, well-marked bike path meanders through four villages, from North Falmouth to Woods hole. As you pedal and coast along the Bikeway, you'll come upon farms and cranberry bogs, ponds and salt marshes. On a portion of its southerly end, the Bikeway parallels the Vineyard Sound shoreline for a few miles, with spectacular open-water views. Hop off the trail to visit Nobska Point Lighthouse and take a dip at the beach. Along the way, there are plenty of spots to stop for a rest, have a picnic lunch, and take some pics to add to your family vacation album. 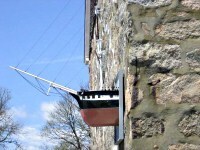 The quaint Falmouth MA village of Woods Hole hosts thousands of visitors each year. Some come to study, work or tour the world-renowned marine science facilities at Woods Hole Oceanographic Institution ("WHOI"). Others make their way to Woods Hole to catch a ferry to Martha's Vineyard. The rest of us - we visit for the village's little gems like: seal feeding time at the nation's oldest aquarium; the raising and lowering of the Eel Pond Drawbridge (quite cool to see! ); and lunch overlooking the water at the Fishmonger Cafe. 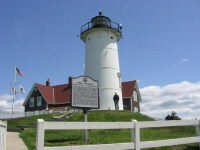 Nobska Point Lighthouse has stood on a small hill overlooking Vineyard Sound for more than 100 years. Originally constructed in 1829, then re-built in 1876, the lighthouse is one of only five lighthouses on Cape Cod that are open to the public for tours. It's been a while since the last full-time lighthouse "keeper" lived here. But today, the volunteer keepers do a wonderful job of educating and entertaining visitors with tales of the light's colorful history. * UPDATE: The interior of the lighthouse at Nobska Point is no longer open for public tours. But it's still a beautiful place to visit, snap some photos, and take in the spectacular views of Vineyard Sound! 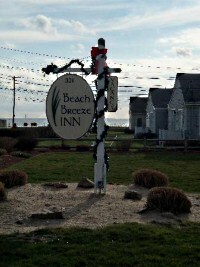 One of my top recommendations for Falmouth lodging is the Beach Breeze Inn. A little bit upscale, and every bit "Cape-y", the Beach Breeze is the kind of place where you feel at home - and totally relaxed - the moment you arrive. Guests speak glowingly of the accommodations and the service here. And the location can't be beat - within walking distance to Falmouth Village, near the Shining Sea Bike Trail, and just a stone's throw from Surf Drive Beach on Vineyard Sound. Enjoy your visit to Falmouth MA!